At the GSPCA until only 2 weeks ago we hadn't on record rescued a kingfisher. Only days before the Animal Welfare Seafront Sunday we rescued Deborah Kerr as we named her from the model yacht pond and we released after 24 hours of care. 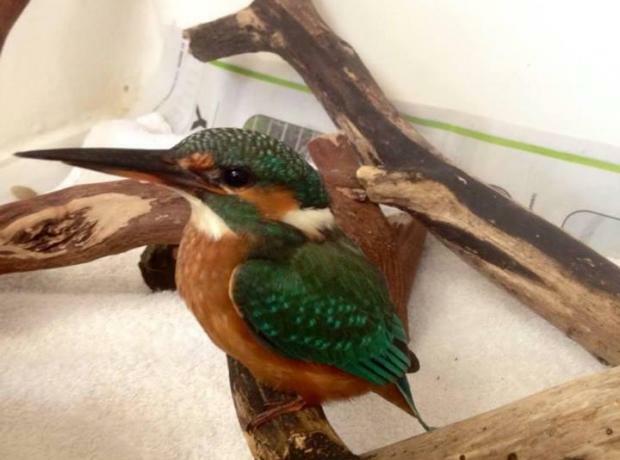 Yesterday a second kingfisher was rescued and brought into the Animal Shelter in St Andrews. The majestic bird was found stunned on a drive in the Vale and is now in an Intensive Care Unit. You may recall that last week we rescued a Kingfisher from the Model Yacht Pond in St Peter Port. The female bird was exhausted and dehydrated and was the first of its species to be rescued by the GSPCA as far back as the team or records can recall. She was named Deborah Kerr (after the actress from the 'King and I') and responded well to treatment so after 24 hours cage rest and what was a very quiet bird on arrival to a bird that was raring to go the decision was made to release her in a suitable location.